Have you heard the news? No? The Weekly Adoption Shout Out is getting a new home. 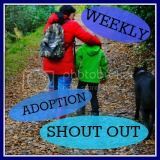 In just a couple of weeks, from the 14th June, The Adoption Social will launch, and from then on, the Weekly Adoption Shout Out will be based at www.theadoptionsocial.com. It won't change - it'll still be weekly, it'll still have an optional theme every other week, the way you sign up will be the same, but it will proudly sit amongst other information, blog posts, and linky's that you might find helpful or interesting. It'll also provide a place for the brilliant #WASO community to grow and gain even more support. Here's more information about The Adoption Social (which has been developed by me and Sarah at the Puffin Diaries, so it'll still be us you're in touch with). And although the site isn't quite live yet, we do have a Facebook page, and we're on Twitter too. For now, let's concentrate on this week and last. You can still see last week's entries here. There was a theme of 'treasured moments' and as usual, we had some great posts with some lovely moments shared. Next week's theme is 'food' - that could be things that you make with your children, food problems and issues, whatever you like. This has been inspired by a conversation with Mini, which I'll share with you next week. As usual, this linky is live on The Boy's Behaviour and The Puffin Diaries, but you only need to add it once. There are no hard and fast rules, but to keep this community supportive, it'd be great if you could visit at least one of the blogs listed and leave a comment. You can also tweet your favourites, using the hashtag #WASO.